The field of microfluidics has been developing rapidly since its inception roughly a decade and a half ago. Growing out of the field of MEMS (micro-electro-mechanical systems) research, microfluidics has developed into a discipline in its own right, with a wide range of scientists and engineers now working in this area. The overall aim is the development of miniaturized biological or chemical analysis devices. Microfluidics has changed the way modern biology is performed. 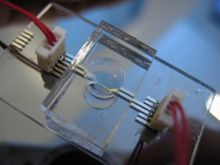 Microfluidic devices offer the ability to work with smaller volumes, shorter reaction times, faster diffusions and the possibility of parallel operation. They also made possible to integrate an entire laboratory onto a single chip which is called Lab-On-A-Chip. In addition to the traditional advantages conferred by miniaturization, the greatest potential lies in the physics of the microscale. One is the very high surface area to volume ratios. Microfluidics technology and microfabrication techniques can be used to make microscale valve, mixers, pumps, sensors, filters, etc. The laws that govern the microscale are being exploited to control fluid in ways not previously available. Reducing sample size, decreasing assay time, and minimizing reagent volume are all advantages of the microscale. The greatest advantages will be seen where applications are identified that can only be performed due to the physics of the scale. A microfluidic chip is a set of micro-channels etched or molded into a material (glass, silicon or polymer such as PDMS). The micro-channels forming the microfluidic chip are connected together so as to achieve a desired function (mix, pump, redirect and/or allow chemical reactions in a cell). This network of microchannels trapped in the microfluidic chip is connected to the outside by inputs and outputs pierced through the chip, as an interface between the macro- and micro-world. It is through these holes that the liquids (or gas) are injected and removed from the microfluidic chip (through tubing, syringe adaptaters or even free holes in the chip). The simplest microfluidic devices consist in microchannels molded in a polymer that is bonded to a flat surface (a glass slide as an example).The polymer most commonly used for molding microfluidic chips is PDMS. The PDMS is a transparent, biocompatible (very similar to silicone gel used in breast implants), deformable, inexpensive elastomer, easy to mold and bond with glass [read more about PDMS]. For these reasons it has been acclaimed by researchers. - In medicine with the laboratories on a chip because they allow the integration of many medical tests on a single chip. - In cell biology researches because the micro-channels have the same characteristic size as the cells and allow such manipulation of single cells and rapid change of drugs. - In protein crystallization because microfluidic devices allow the generation on a single chip of a large number of crystallization conditions (temperature, pH, humidity…) And also many other areas: drug screening, sugar testers, chemical microreactor, microprocessor cooling (just reward) or micro fuel cells. For more information: Read 2002 paper, read 2010 paper.